This posting is only of benefit to those who do hand applique – sorry. ^_^ And for ya’ll, well, you may just love it. These are the pictures I took for the ‘rough draft’ of a book that may or may not ever get written!!! Get out a piece of fabric that is at least 6” long and has a nice clean straight edge – with no frays or wiggles. Turn your iron on high and max steam. 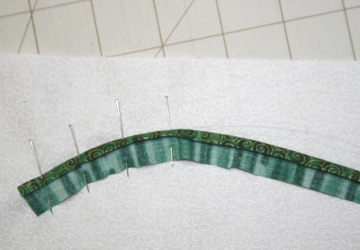 Place the fabric, right side down with the clean edge toward you. Fold the edge over to whatever thickness you want your stem to be – usually less than ¼ inch. As you fold, use a pin to keep the fabric folded. (Use only pins with glass heads.) Do this by inserting the pin as parallel to the ironing board cover as possible and sticking the pin into the cover. (see below) Put the pins in with the point coming toward you (perpendicular to the edge)so the pin actually does hold the turned edge down. Do this for the length of the fabric. Press and remove the pins. Now, do the same thing again so that you have a double thickness fold. (see below). Once again, press and remove the pins. Cut the double folded piece off – cutting about ½ inch away from the fold. (see below). Yes, you do need about a ½ inch as it gives you something to hold onto and something to pin into when you are positioning the stem onto the background. To position the stem onto your background, place the folded edge right at the outside/larger edge of the curved stem. 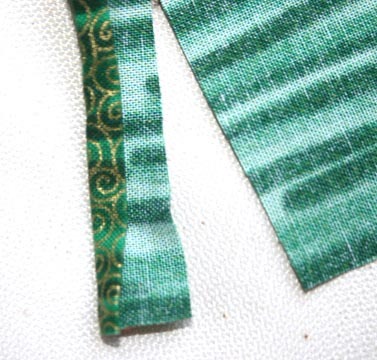 Since these stems are done NOT on the bias, they do not stretch, so you always need to sew the longer edge first and then ease the inner/shorter edge. 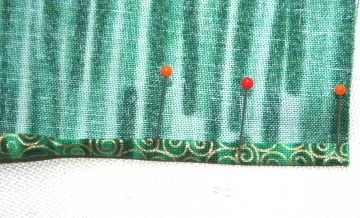 Pin it down as you go – once again inserting the pins perpendicular to the stem (see below) to hold it in place. You will also discover that if you have made your stem wider than you’d like, before you pin it down you can roll that double fold back and finger press it. And you will find, once you have practiced a bit, that you can make very, very skinny stems by doing that. This is the method I have used for all the stems in all my designs. Yes, even some that look like they are really bent! And there you have it. This is actually Chapter 3 of “The Book”. That is, if there ever IS a book! Enjoy. Ok, it is now Dec 2012 and I have recently created a new design that calls for several, extra skinny ‘stems’ – like for the stamen of a flower. In the process of doing the sample, and after having folded the fabric really ‘skinny’ – I wanted it even skinnier! So I am now adding 2 more bits of information/tips – one I have shown in my classes all along and the second the one I just ‘discovered’. First: If you would like to add a little ‘dimension’ to your stem, you can do that by pushing on that edge and holding it in just a little. You will notice that causes the stem to kind of ‘bow’ up and if you then make the stitch, it will stay that way and your stem looks and feels more ’round’. Thanks for the tip! Just starting a geranium wall hanging! Great info! Thank you. I love applique and want more of these great tips.